A very belated birthday present was a day on the river with Master Fly Casting Instructor, Matthew Howell. Well, why not?? My request to Matt was simple – I have a Sage Fli 7’6” 4wt (The Flirt!) I need to make friends with and I would like casting and stream craft instruction in situ in the kind of surrounds I love: small creeks where not many people go. Matt took me at my word! 4WD down some interesting tracks eventuated at our nominated spot – a stretch of creek up in the Buffalo River National Park region that neither of us had fished before but looked promising when Matt checked it out a few days prior. Those scratches on your new truck will polish out, Matt – I think. Clambering down the steep bank into the creek, we spotted a small brown and saw a rise in a pool further up. Promising, very promising!! The Flirt was put together in record time and I made my first cast of the season. Next to me, I could feel Matt sag in disbelief as I made what was probably the worst cast of my life! Just as well I had a Master Caster to sort out the problems! Some tuition and a few warm up casts and things were looking a little better. 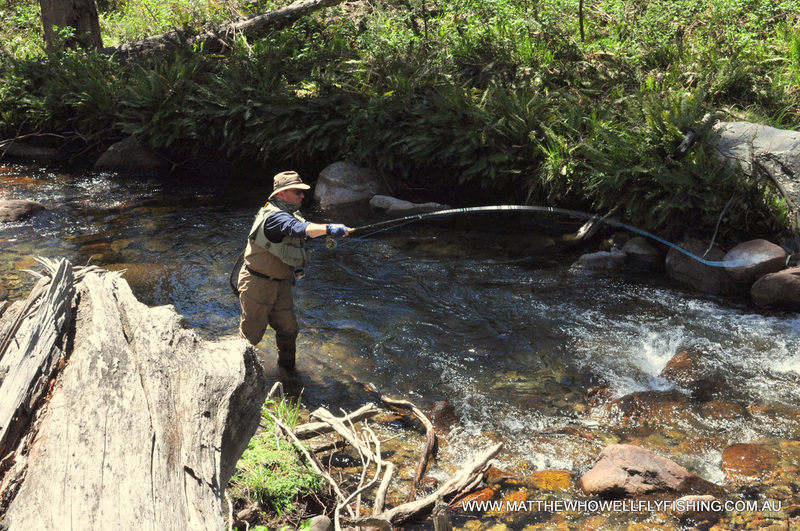 A couple of meters upstream, I had my first hit.... you guessed it – I was so excited I ripped the hook right out of that poor trout’s mouth. Oh well, try again..... and again.... and again. Two hours later, my casting had improved immensely! ! Everything that I had been shown by various members of the Greenwells Club, George Foster and now Matt was coming together in a way I had never imagined! We were on the water and I could finally understand what was required with someone right beside me every step of the way, explaining what I was doing wrong and cheering when I got it right. I was roll-casting correctly about 70% of the time and casting to where I was instructed! Woo hoo –this was more like it! Matt had even convinced me to loosen my death-grip on The Flirt and we were into more difficult stuff like roll casting from my left-hand side. Wow – all we needed now was to see some fish!! They’d gone into hiding after those first few pools!! We ploughed on tenaciously, working that creek with serious intent. A sweet little run appeared and I worked the reeds on the right hand side. A trout showed interest and then backed away. Another cast – nope, another one.....he took another look.... on the third cast the fly hit the branch above, stayed for a moment and plopped down into the water – now I was even presented the fly naturally!! And that beautiful little rainbow was fooled! Got him!! Insects were starting to appear on the water as we fished on .... and we were seeing fish again. More insects.... what the.... an ant hatch!! You beauty!!! Poised to cast into a likely looking run we froze when a huge commotion erupted in the middle of the creek. 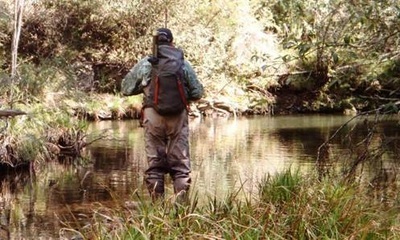 A monster trout chased a little trout downstream, right between the two of us standing close together, flipped back round over my boots, lay contemplating life for a moment before giving me a good slap on the leg and taking back off upstream!! We couldn’t believe it – don’t you just love the unexpected things that happen when you’re fishing!! Oh, hang on..... there’s another rise. Back to work! Now I was actually casting to a rise and working an area – unbelievable!!!! Three or four casts later, I had my reward: a lovely little brown about the size expected up here. “Does it get any better than this?” I thought. Nearly time to start walking out, given that neither of us had fished here before and the location of the road was a little vague, not really something we wanted to attempt in the dark. Another rise upstream... and another in the same spot... a long, slow rise that seemed to go on forever. Matt told me afterwards he realised then that it was the same monster that had landed on my boots a few meters back but didn’t dare tell me. I sort of thought it looked a bit bigger in the water than the others we’d seen.... “Just one more, Matt?” Silly question!! Cast... he sipped an insect off the surface right next to my little Adams fly. The cheek of it!! The intensity of our combined gazes should have levitated that trout right out of the creek!! Cast again.... terrible cast... nowhere near the mark!! Matt’s steadying voice: “Forget the trout, concentrate on the roll cast. Elbow up, bring it down, squeeze! !” Another bad cast! “Cast again.” On the mark!! Nope, not interested! Cast again... “He’s taken it!!! Steady, steady....lift! !” It’s on!!! The Flirt bent double under the weight, giving me a clue that perhaps it was rather a large trout!! “Let it run” “Turn him on his side away from the log” “Work him up to the sand bar. Let him run... rod tip up...turn him, turn him, great work.... work him over to the sand bar again..let him run, keep the tip up. Work him back to the side. GOT HIM! 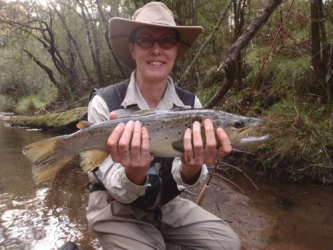 !” 3½lb of monster brown trout caught way up in small creek territory, on a little 7’6” 4wt Sage – no, they REALLY don’t come any better than that!! Would I spend good money on a day’s tuition and fishing with a Master Caster like Matthew Howell again? You bet!! It’s already on my Santa list – all contributions gratefully accepted! PS– The has been renamed. She is now “The Trout Slayer”! When you love fly fishing as much as I do, and you get to do it as infrequently as I do, then you get pretty picky about deciding where to go. I had read many enticing articles (Trevor Hawkins, Philip Weigal ) about the fishing in the North East of Victoria, but I had never been. More recently, anecdotal reports suggested that the excessive summer heat last year and the effect (polluting run off) of bush fires had set the fishing back quite a bit. And then I read Philip Weigal’s latest guide book focusing on the NE, and I remembered my mate Peter in Tassie had a guiding friend up that way; so I called Matthew Howell. Now I think Mattie was a bit peeved when I first asked him if it would be “worth me coming up to Myrtleford”. I didn’t mean it to sound as arrogant as it probably did. Nevertheless, he patiently and candidly explained that, while things hadn’t been so great last year because of the extreme heat in March, he firmly believed the majority of fish were still there – it was simply a question of finding them. He also mentioned that the Ovens had just been stocked with several thousand mature trout, so that alone could keep me busy enough. Game on. My mate Rodney picked me up off the train at Benalla, and we drove on to the Ovens pub, stopping only to stock up on Milawa bread and cheese. 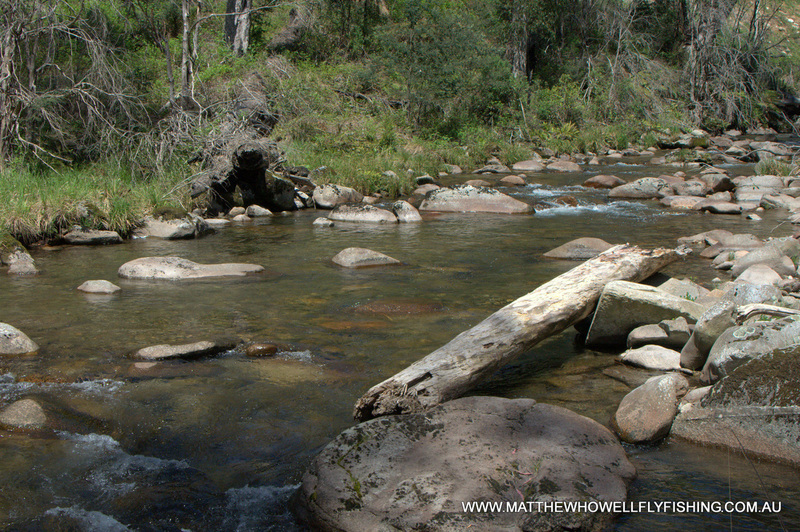 It was late afternoon, so we drove along the Ovens River, up through Bright to Harrietville, scouting and speculating where we might go the next day. We phoned Mattie again, confirmed he could take us out on Monday, and picked his brains about where to fish in the meantime. Saturday dawned wet and grey and it stayed like that for most of the day. Not discouraged by the rain, we were on the water by 8.30 and fished happily on the Ovens towards Harrietville, picking up a few fish here and there. All on a small nymph, suspended under a dry. We bumped into a couple of chaps from the Northern Suburbs FF Club, who told us how they had caught 50 fish the day before, in the beat we had just finished fishing (no wonder the fish were a little scarce!). We also learned the rest of the club were camped at Freeburgh for the weekend – so we would need to be on the water earlier, or go more off-piste. On Sunday, the weather had cleared and we returned to the Ovens. We thought we had picked somewhere a bit harder to get into, to avoid the NSFF hordes – and we managed 7 or 8 fish between us (including two good ones for Rodney). Not a cricket score, but we had a lovely time on a beautiful stretch and a feeder creek. We didn’t see anyone, but suspected we may have been following in someone else’s footsteps, as from the look of the water (superb) we would have expected to see more fish, even if we couldn’t catch them. As planned, Mattie met us on Monday morning – which dawned clear but freezing cold (as in ice on the windscreen). But it was forecast to be warm, so Mattie took us , right up into the mountains. I’d tell you where exactly, but it was a blur of windy tracks and unmarked turns. Pretty country though, and the river – oh my. I had only seen such bluey clear water in NZ. And here it was (on a smaller scale) in NE Victoria, just for us. We had a ball. 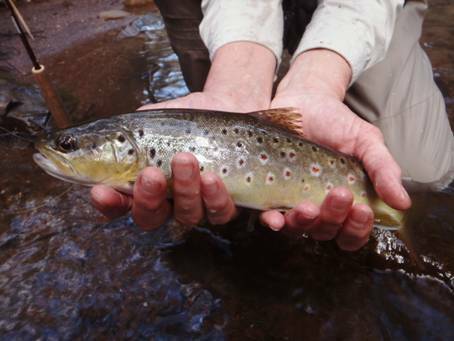 Lots of banter, great fishing, small dry flies and stunning scenery. What more could you want? 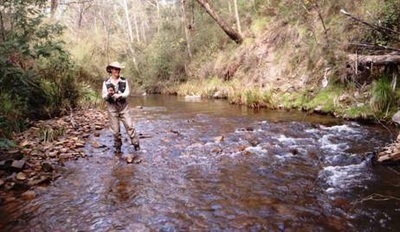 Mattie even took us down on to the Kiewa River, to fish the evening rise. Something neither Rodney nor I had done before. It was exciting waiting for the hatch as twilight fell. The hatch was very short, as the temperature dropped quickly after dark, but we managed one fish. Mattie dropped us back at the pub around 9.15pm, which must have made it at least a 15 hour day for him. He worked extremely hard for us and gave us a great day out. He was full of useful tips on stream craft, correcting our casting when required (quite often! ), as well as keeping us entertained with witty one-liners. (I’ll let him tell you what other uses toilet paper can be put to!) As we drove along, he was also very generous in pointing out access points and telling us about good spots to try next time. I wished I’d taken a tape-recorder. “So, was it worthwhile, coming up to the North East?” he asked me with a grin, as we shook hands outside the pub. You betcha, Mattie!! And, as Arnie would say, I’ll be back. On the drive home, Rodney and I agreed that while we could do some of it by ourselves, we would definitely want (and need) Mattie to show us the best places to go.